This is number 29 in the upcycled blues series of quilts. I had had several blue fabrics that were primarily blue but with a bit of red in them as well. I decided on this pattern and instead of fighting the red, went with it - embracing it. 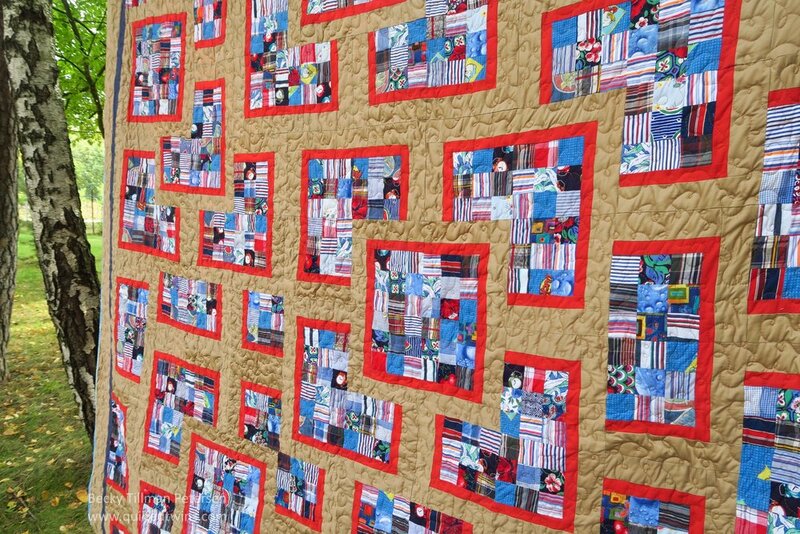 The quilt design came from my teenage years when my sis and I used to make paper and picture scrapbooks. We used a lot of things such as napkins or special pieces of paper from things we went to— often carefully overlapping one piece on top of the other just like this pattern, with the main thing on top. It’s an incredibly easy pattern using only one block. Placement of the block is critical, though, to get the look you are going for. I did have to piece the backing from several different reds. All upcycleds. Leaves are starting to fall here. My husband works hard at keeping them off the grass, though. I didn’t remember that I had made this top so big! Those extra 10” really do add up when quilting! It felt like it took forever. Of course it didn’t. I did the easiest type of quilting I know how to do on it but it was still quite a bit to haul around. I have updated the picture and pattern both on the free patterns page and the upcycled blues page.